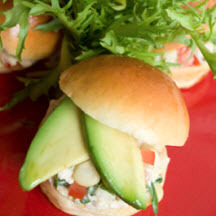 CooksRecipes has quality, kitchen-tested recipes for a variety of meat and seafood cocktail and tea sandwiches, sliders and mini burgers that are perfect for parties and entertaining. For social gatherings, opt for the smaller cocktail-size buns available in the bakery section of grocery stores. 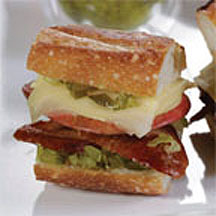 These bite sized sandwiches are fun and easy to make, and are a definite crowd pleaser. 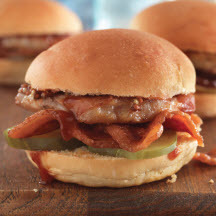 Combine roasted sausage, Jarlsberg cheese and relish, with crunchy thin-sliced apple and you have a delicious slider, a popular mini sandwich to serve at parties and potlucks.